SBI vs HDFC vs ICICI vs PNB vs Axis Bank: Are you aware of the hidden charges you pay for every transaction you make with your debit cards? SBI vs HDFC vs ICICI vs PNB vs Axis Bank: Are you aware of the hidden charges you pay for every transaction you make with your debit cards? For example, everytime you use an SBI Debit card on other banks' terminals, you end up paying 2.5% or Rs 10 (Whichever is higher). Similarly, if you use an HDFC debit card at railway stations, you end up paying Rs 30 per ticket extra + 1.8% of the transaction amount. These charges are all available on the websites of the banks but users are not always aware of them. Following are all the charges SBI, HDFC, Axis Bank, ICICI Bank and PNB take from you for using debit cards. If you use another card, check the charges you pay on the website of the bank. - There are no charges for using the Debit Card at domestic merchant locations and websites. - However, at select merchants like IRCTC / railway stations, transaction charges/surcharges as per industry practices will be applicable, by the merchant. Railway Stations: Flat charge of Rs. 30 per ticket + 1.8% of the transaction amount. - Fuel Surcharge would not be applicable for the transactions done on HDFC Bank swipe machines at government petrol outlets (HPCL/ IOCL/ BPCL). Decline charges for insufficient balances (For non-HDFC Bank Domestic/International ATMs as well as at International merchant outlets/online stores) - Rs. 25 + applicable taxes per transaction. Cross-currency mark-up charges on foreign currency transactions - 3.5% + applicable taxes on foreign currency transaction carried out on Debit Cards. The exchange rate used will be the VISA/MasterCard wholesale exchange rate prevailing at the time of transaction/merchant settlement. - Fee for replacement debit - Rs. 200.00 plus 18% GST. 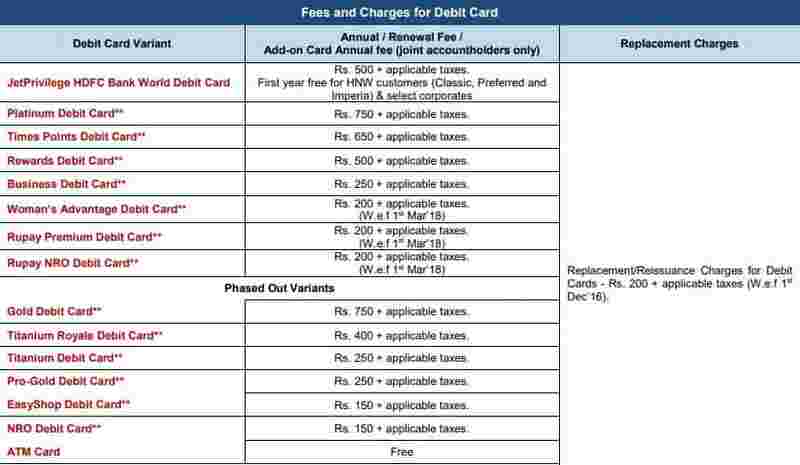 - ICICI Bank Expressions Debit Card charges: Joining fee Rs. 499/- (Plus GST) only. Annual charges of Rs.499/-(Plus Goods and Service Tax ) from second year onwards is . - Rs.499 coral debit card: Annual fee is debited upfront every year after the 1st year. Annual fee:Rs.1499 + Goods and Service Tax. Annual fee is charged from the 2nd year onwards. Joining fee charged only for the 1st year. Re-issuance charge is 200 + GST. - 18% GST is applicable on the charges w.e.f. July 1, 2017. - POSDEC CHRGS levied in the statement: If a transaction is declined at any Non-ICICI Bank ATM or Point of Sale (POS) due to insufficient balance in the account, charges of RS 25 plus 18% GST is levied. The charges reflect in the account statement with narration as 'POSDEC CHRGS'.